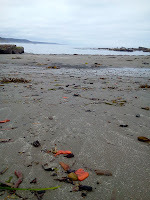 The tide was low at 6 am on May 8th as our Embryology class descended into South cove at Cape Arago, OR. 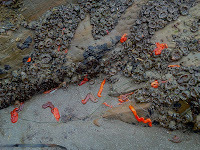 As we made our way to the tide pools we noticed a few live Nipponnemertes bimaculata, bright orange ribbon worms (nemerteans), laying among the floatsam and kelp washed up onto the sandy beach of the cove. The two characteristic brown spots on the head are responsible for the specific epithet (“bimaculata” means “two spots”). 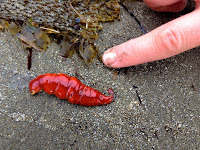 Svetlana, our instructor and an expert on the biology of nemerteans, thought it strange; these are usually subtidal and are only occasionally found under rocks intertidally, but are not generally known to get stranded on sandy beaches. Puzzled, we continued on to the tide pools to collect bryozoans (our study subjects that day). 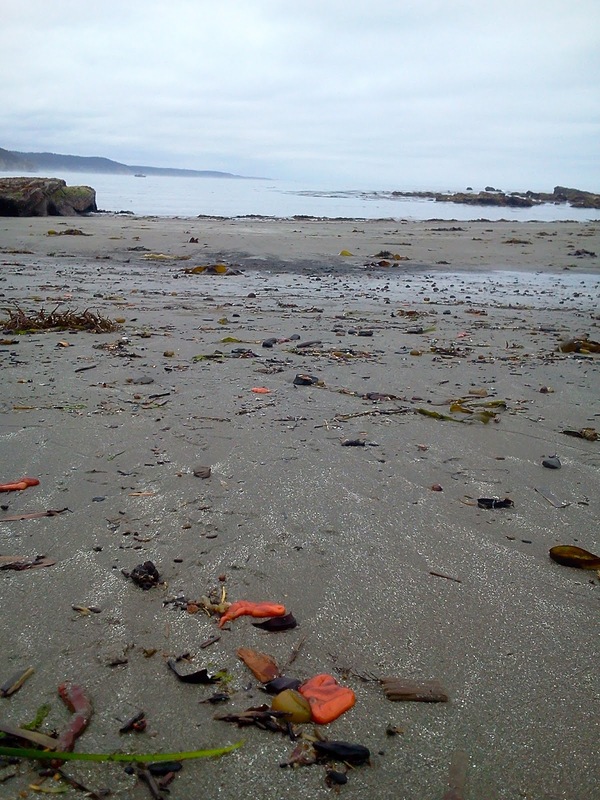 When we made our way back to the sandy beach at about 9 am we found the beach littered with stranded N. bimaculata. We soon realized that most of them were releasing gametes! Hundreds of these worms got stranded in an unheard-of, for hoplonemerteans, mass spawning event. N. bimaculata and other members of the family Cratenemertidae are unusual among monostiliferan hoplonemerteans because they can swim by undulating their body. Svetlana hypothesized that the worms (normally benthic) were swimming and spawning en mass, when the change in tide and currents got them stranded. We collected several of the worms of each gender, placing males and females in separate bags as well as in a bag together in order to observe embryonic and larval development, which has not been previoulsy described. The males were rather orange and released white sperm, while the females were somewhat darker (brownish or greenish) due to the color of the eggs inside them, You can see both males and females on this picture. Sexes cannot be easily distinguished once the worms release gametes. On our way back to OIMB we checked the sandy beaches of Middle cove at Cape Arago, and the nearby Sunset Bay, but they were devoid of nemerteans. This may be either because the suitable adult habitat is lacking (e.g. kelp holdfasts) or because the hydrodynamics are different in these coves. The greenish ~ 265 micron eggs are loosely connected by jelly when released, are very delicate despite the protection of the chorion, and easily rupture when handled. Most of the eggs in our culture disintegrated after the first few days, but a few developed into planktonic planuliform larvae, one of which is depicted here - a week and two days after fertilization. Note the two large reddish eyes and conspicuous lipid droplets. Most hoplonemertean larvae have several pairs of relatively smaller eyes (e.g. see blog posts by Jenna Valley and Kirstin Meyer). The larva depicted here is 460 micron long.